When starting a makerspace, it’s sometimes helpful to start students off with some project ideas to get their creative juices flowing. Many students are so used to finding one “right” solution to a problem. Teaching students that some problems have many solutions and that finding those solutions might take some time…well, that’s a mindset and habit that often requires practice. 3. Immunity to assessment…Students will want to do the best job possible when they care about their work and know that you put them ahead of a grade. If students are collaborating and regularly engaged in peer review or editing, then the judgment of an adult is really unnecessary. Quoted from: Stager, G. S. (2012, June). A good prompt is worth 1,000 words. Retrieved from http://stager.tv/blog/?p=2779. There are many ideas on Pinterest and social media for STEM and makerspace challenges/prompts, and I made a set of task cards based on some of them to jump-start students’ imaginations. 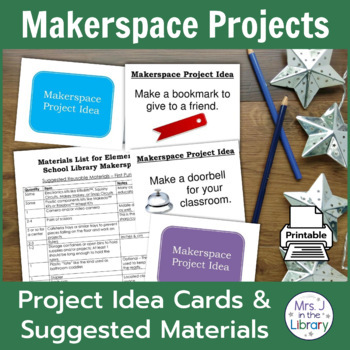 As part of a flash freebie promotion on Facebook, my Makerspace Project Prompt Task Cards & Materials List is FREE in my TeachersPayTeachers Store for this week only! Grab it while you can, and try it out! Also, if you have more prompt or challenge ideas, I’d love to hear them in the comments!